Visiting the Taj Mahal in Style: Tips for taking photos at sunrise! 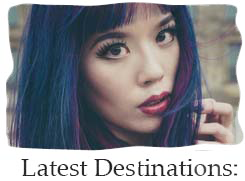 Entry fees, tickets & best photography locations. 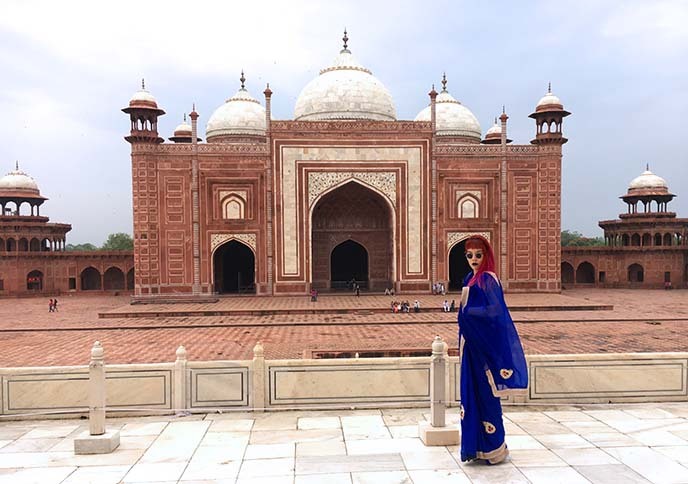 And… this is how you Taj Mahal in style! 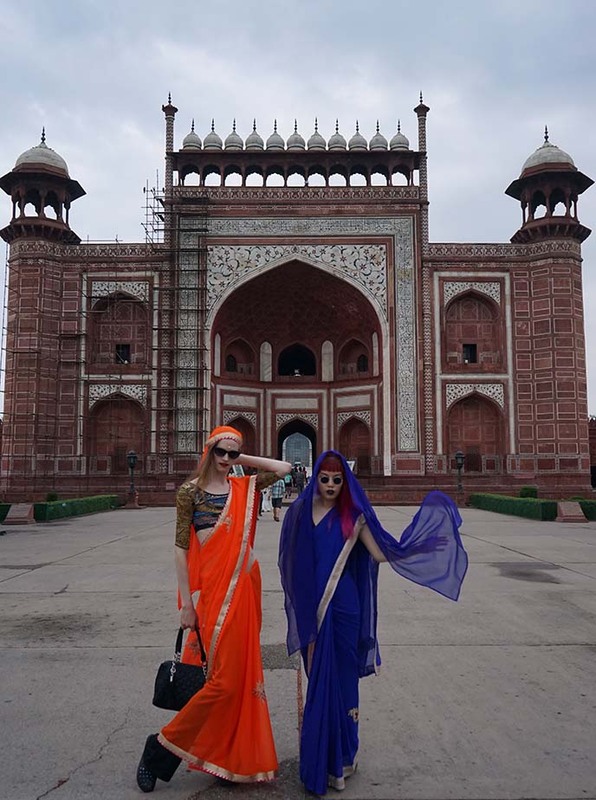 Yukiro and I always travel fabulously, but I think we took it to the next level at the iconic mausoleum in Agra, India. However, don’t expect to swing by at any time for photos like these. 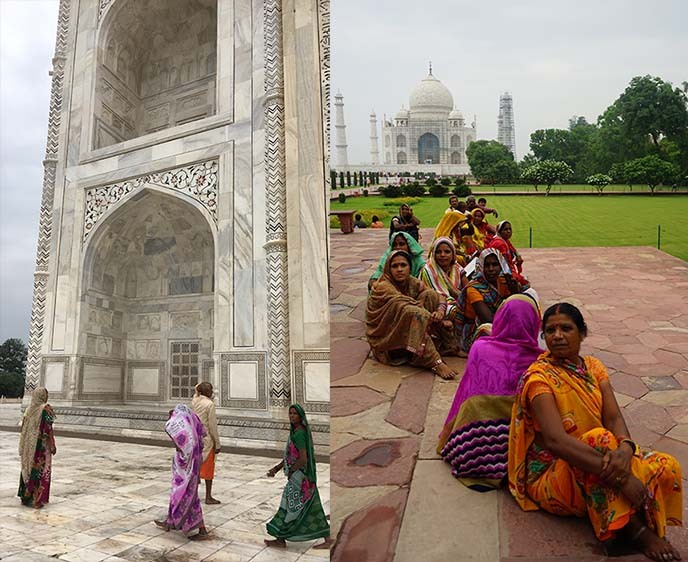 Visiting the Taj Mahal takes preparation, and a reputable local expert can help make the most of your visit. Janu Private Tours, our brilliant guide throughout India, took care of all the arrangements for this perfect sunrise tour of the Taj. Read on for travel tips on how to make the most of your visit to India’s most famous landmark, the Taj Mahal. We’ll share locations for taking the best photographs, and the story behind this romantic monument. 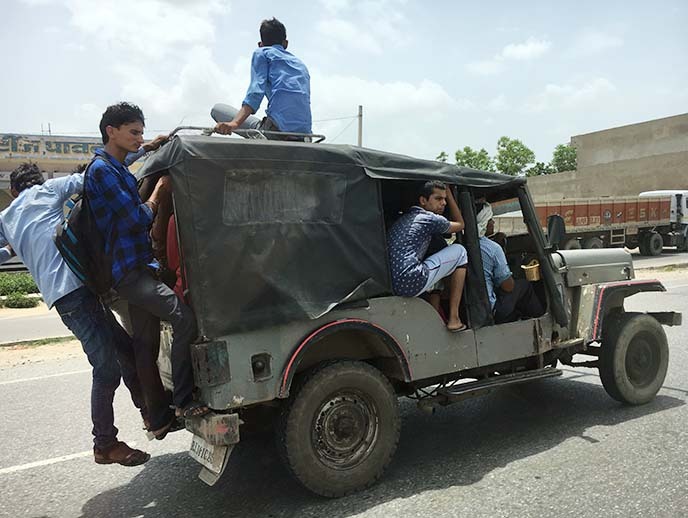 Be sure to read on to the end: there’s a bonus tour of Fatehpur Sikri palace, and Mad Max driving shenanigans in India! 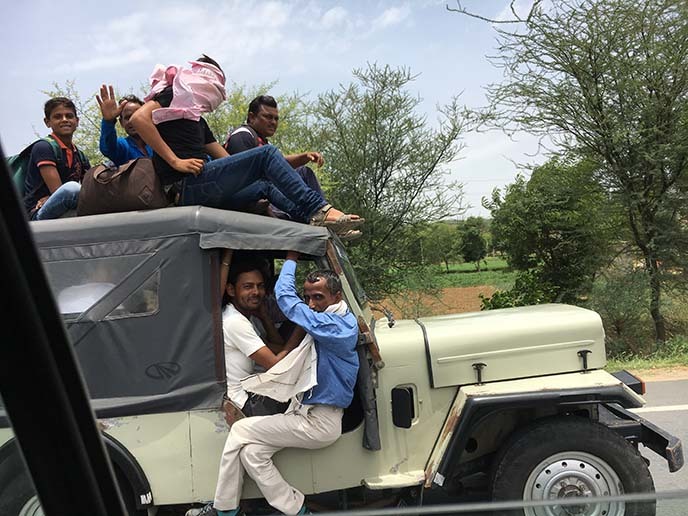 Mr Janu and his team at Janu Private Tours have organized thousands of trips, and know how to help travelers get the best possible experience at the Taj Mahal. Unlike most tour companies, Janu customizes all itineraries, and provides a private car, driver and fluent guide for their clients. We arrived in Agra in the evening, ate dinner at a delicious Indian restaurant, and got a good night’s sleep at our 4-5 star hotel. The next morning, our local guide Deepak was waiting for us in the lobby at 5 am, as sunrise is the best time to visit the Taj Mahal. A lady at the hotel helped us put on these saris, using only three safety pins each — amazing. Entrance fee, access and hours: The Taj Mahal is open daily from sunrise to sunset, except on Fridays. What to pack for visiting the Taj Mahal? I suggest that you bring mosquito spray, a bottle of water, a handheld fan, money in India rupees, and your phone / camera. 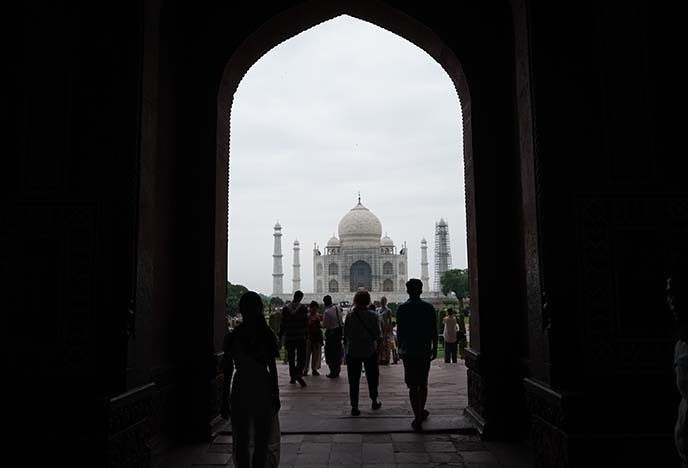 Do you know the love story behind the Taj Mahal? Shah Jahan, the fifth Mughal emperor, was devastated by the loss of his favorite wife Mumtaz Mahal (she died giving birth to their 14th child). He was determined to build a magnificent mausoleum in her loving memory, which was completed around 1653. 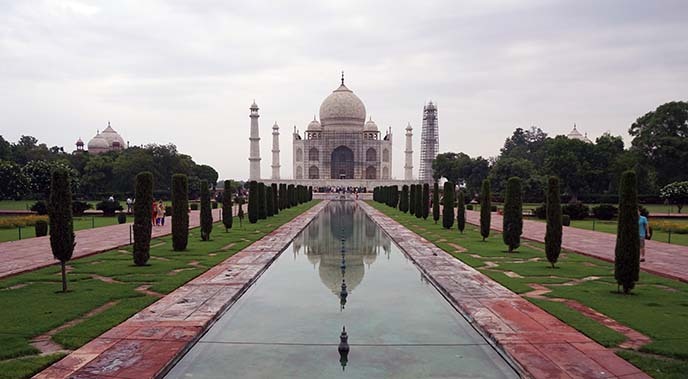 Shah Jahan spared no cost: the project would have cost around $830 US million today. As we walked through the gate and glimpsed the famous dome, Deepak told us about the Mughal architecture of the Taj. The complex is a masterpiece of refinement and symmetry, with perfectly proportioned lines radiating out in the four directions. Pretty much everyone tries to get a photo in front of the long reflective pool. However, it’s impossible to get clear shots like these, unless you come at dawn. It’s well worth waking up before sunrise to put on something special, and take unobstructed photos like these. 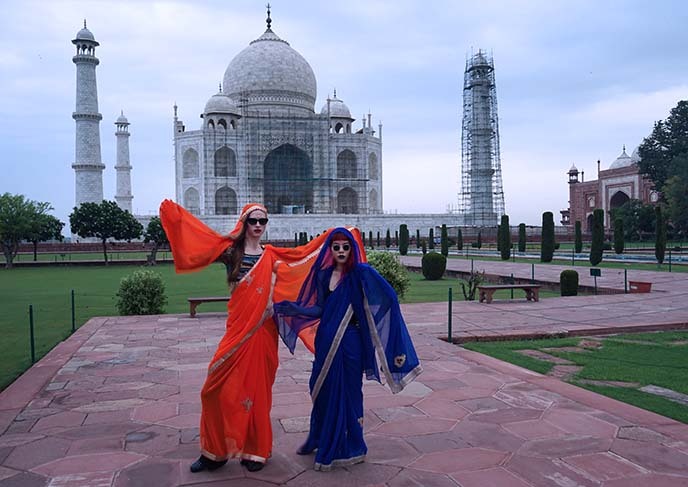 After all, visiting the Taj Mahal is usually a once-in-a-lifetime experience… you might as well “work it”! As you can see, there are only a handful of visitors right when the doors open at sunrise. 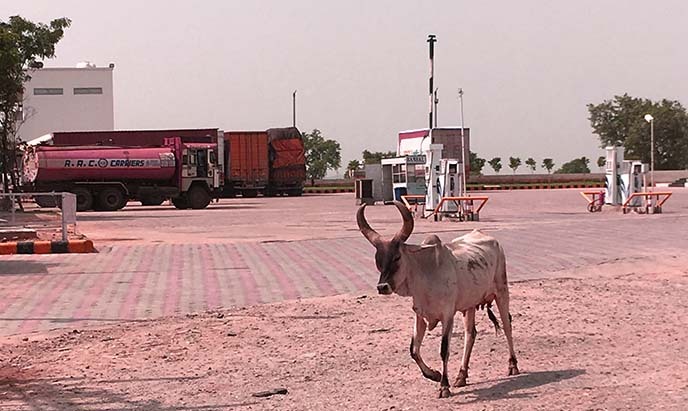 It also helps to come to India in the off season (we were here in early July, just after the high heat and before the monsoon rains). I looked over at the meticulously arranged gardens, with the number of trees and partitions chosen according to numerology. For example, the division into four quarters symbolises the four flowing rivers of Jannah, or Paradise. 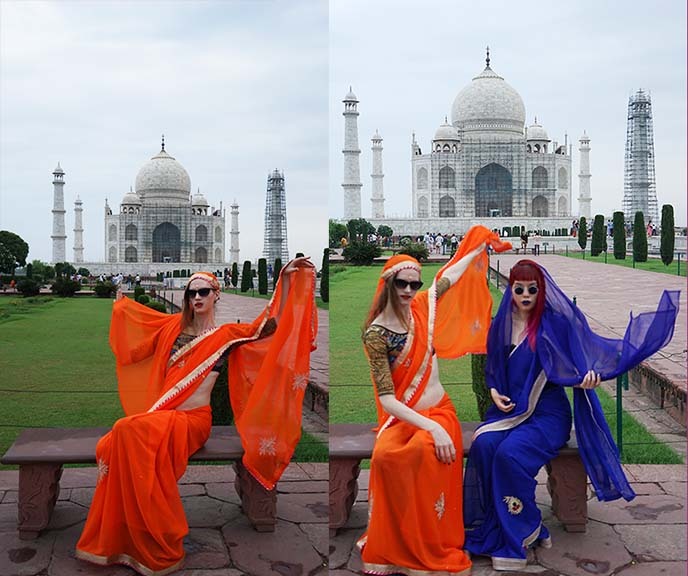 What should you wear to the Taj Mahal? It’s always a good idea to cover your shoulders and knees out of respect to the local culture. If you decide to enter the mosque, then you’ll have to cover your head as well. 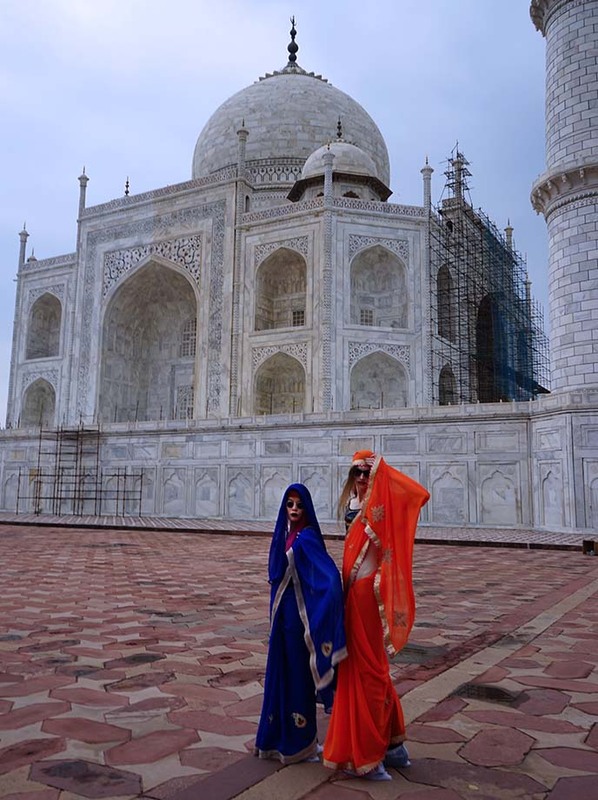 Many women wear saris to the Taj. Our (third gender) hijra friends from Jaipur gave us these phenomenal saris from Rajasthan, as a gift. The bright colors and light, flowing fabrics were perfect for the weather and occasion. As you walk closer to the white domed roof, you’ll come across this second reflective pool, with a white bench in front. This is “the” famous photo spot, with a southern view of the Taj Mahal. Be prepared for local photographers to approach you, and offer their services. We responded with a polite “no thank you,” since our fantastic guide did double-duty as a photographer! Namaste Deepak for all these images. Here’s another look at the architectural symmetry — isn’t the effect peaceful? The image of the Taj Mahal can be recognized worldwide: four minarets framing the tomb. The long pool perfectly reflects the mausoleum. Shah Jahan commissioned the best artisans to build the Taj Mahal, sourcing fine materials from all over India and Asia. The beautiful white marble and gemstone facades are carefully maintained today, as you can see from the scaffolding. 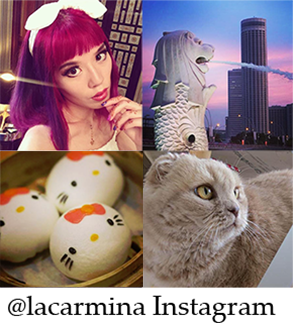 I read about a travel Instagrammer who visited around the same time, and got in trouble for Photoshopping out the construction… Fierce poses require no editing! 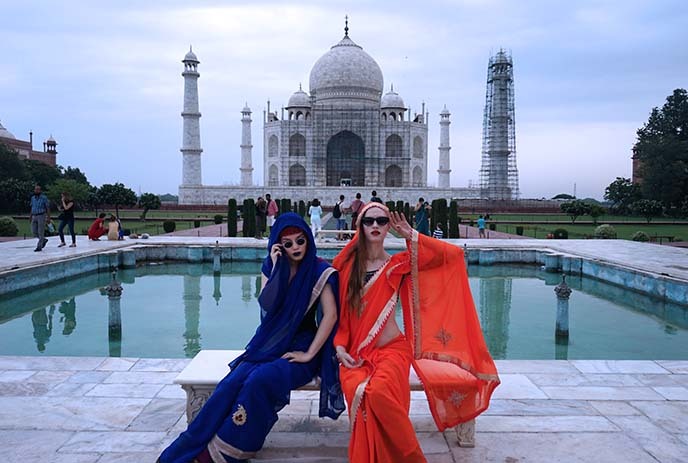 Yukiro and I loved seeing the lovely saris and styles worn by Indian women at the Taj. 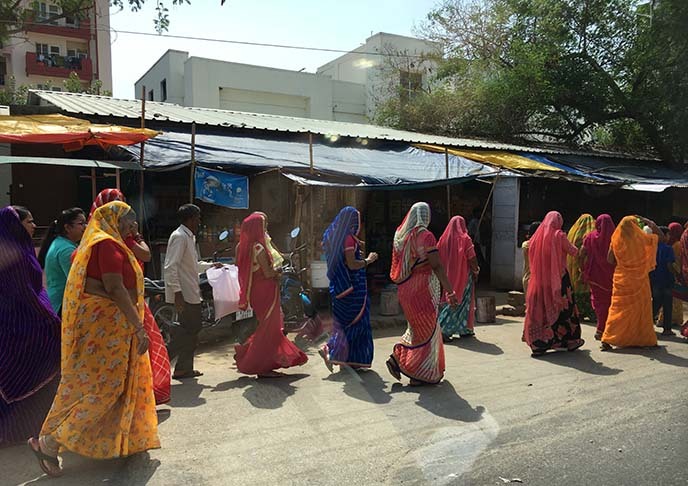 Notice that the group of women have red henna in the part of their hair. Such a unique beauty statement, which reflects their regional customs. When you reach the platform of the mausoleum, you’ll be asked to take off your shoes. You can wear socks inside, or put on shoe covers that are provided (that’s what we did). From a distance, the white marble of the Taj Mahal looks plain. Up close, you can see the intricate decorative elements: Persian calligraphy, and floral motifs made from inlaid gems. The designs are understated and minimal, yet bursting with detail. 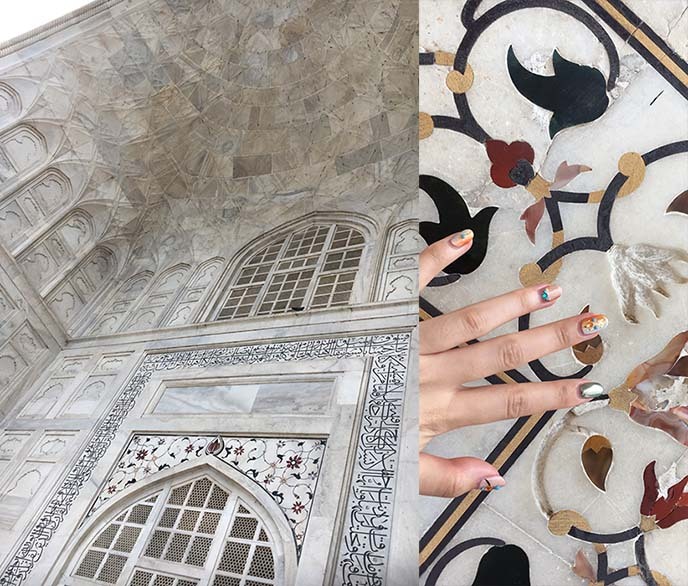 I ran my hands over the remarkable marble carvings, which are precisely inlaid with gemstones like jasper and jade. Visitors aren’t allowed to take photos inside the mausoleum, which is designed in the shape of an octagon, and decorated with fine gems and lattices. You can walk around the tombs of Shah Jahan and his wife. The emperor wanted to build a matching Black Taj Mahal (how Gothic!) for himself. 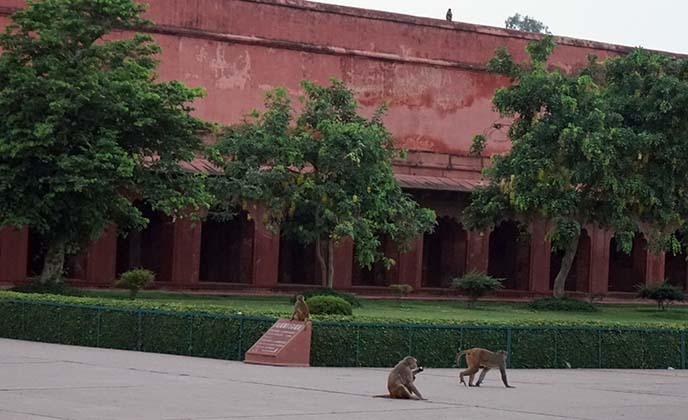 However, the spending had gotten out of hand — and after some family conflicts, his son Aurangzeb put him under house arrest at Agra Fort. When he died, Shah Jahan was buried next to his wife, forming the only non-symmetrical aspect of the monument (since her tomb was designed to be in the center). Be sure to check out the two red sandstone buildings that flank the Taj Mahal. These are a mosque and guesthouse, designed for balance. Even Yukiro looks tiny under one of the Taj’s four minarets. In the old days, the mu’adhin would climb up this tall tower five times a day, to give the call to prayer — quite the cardio workout! Muslims come to the mosque on Fridays, as the complex is open for prayers between noon and 2pm. 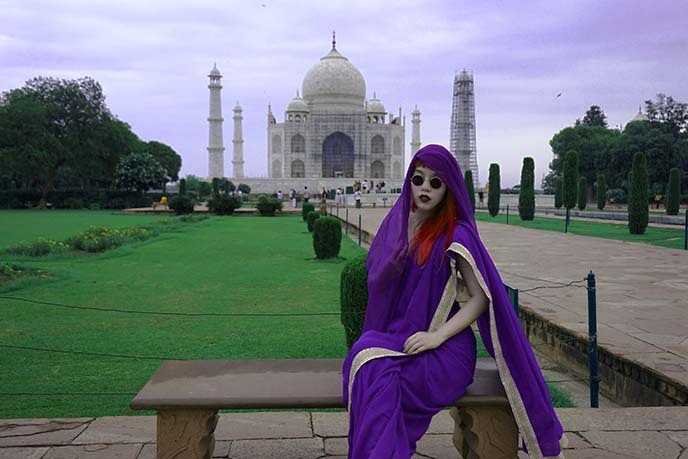 We highly recommend that you come to the Taj Mahal with an expert guide, as we did with Janu Private Tours. You’ll get so much more out of the visit: Deepak answered all our questions about the history and design, took care of the logistics, and helped us take photos from all the best angles. I developed a deeper appreciation of Indian architecture, after this trip. Just look at the harmonious detail above — the lines, arches, spires. Such a joy to see this incredible work of devotion, and one of the New Seven Wonders of the World. Sometimes, famous landmarks don’t live up to their reputation. This is not the case with the Taj Mahal. 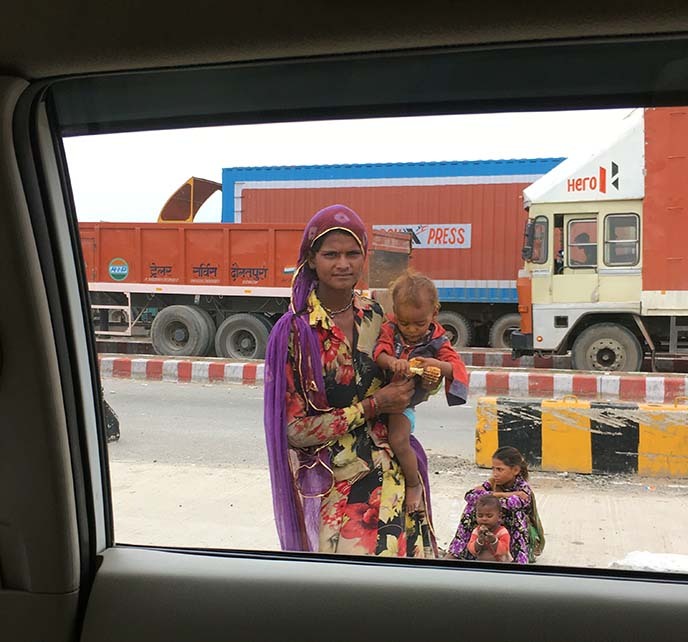 We both agreed that this was one of our favorite moments of our India journey. Since we had so many great photos, I did some psychedelic edits for fun. On the bright side, flight prices are historically lower than ever, and online resources (like travel blogs!) make it easy for travelers to find information about India. If you’re an alternative or female traveler, be prepared for lots of curious (but good-natured) attention from locals. We usually say “no thank you” when people ask to take photos with us, but made an exception for the Indian Army Officers that guard the Taj Mahal. Security levels were strong everywhere we visited in India. If you take regular precautions, you’ll have nothing to worry about when you come here. Timeless, futuristic, the Taj Mahal is a work of genius. The translucent white marble even glows under moonlight! Namaste Janu Private Tours for making this a visit we will never forget. 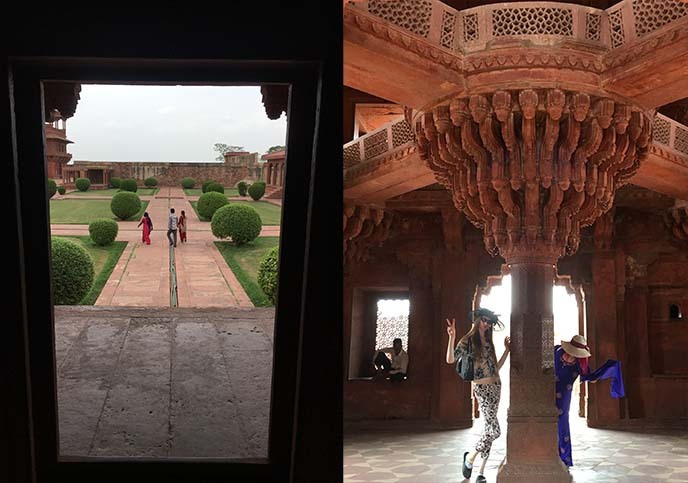 If you’re visiting Agra, there’s another palace you must check out: Fatehpur Sikri. This royal city was founded in 1569 by the Mughal Emperor Akbar, and was the capital of the Mughal Empire until 1585 (due to lack of water in the area and political conflicts). We “royal ladies of Rajasthan” felt right at home here, since that was the purpose of the palace — to house the emperor’s three royal queens. One was Muslim, one was Hindu, and one was Christian. The Hindu consort, Jodha Bai, was his favorite since she was the only one who bore him a son. 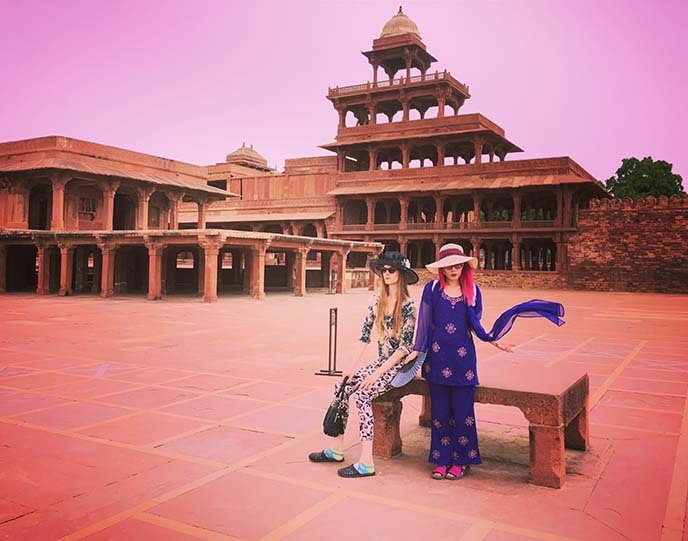 Fatehpur Sikri has a playful vibe, as the emperor enjoyed playing games and living the high life. We toured the various buildings, decorated with carvings that reflect the religions of his three wives. I leave you with some photos taken during our drives between cities in India. We enjoyed spending time with Mr Janu, and he was always happy to explain the unusual sights we saw on the road. 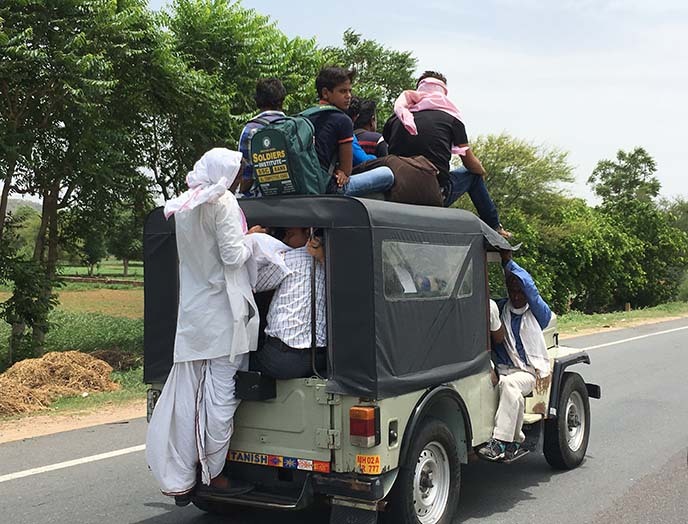 Indian driving is notorious for being a free-for-all. Mr Janu’s drivers are experts who never honk the horn or make risky moves. However, that can’t be said for everyone you’ll encounter… This looks like a scene from Mad Max: Fury Road! 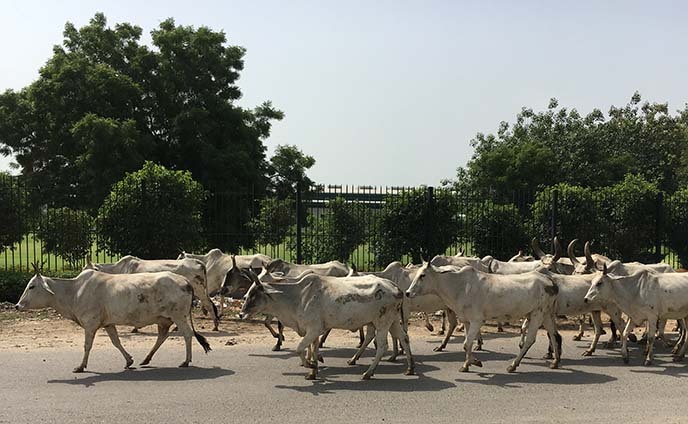 When we saw this sight, we could only say one thing: “Holy cow.” Cows are sacred among India’s Hindus, and treated with great reverence. 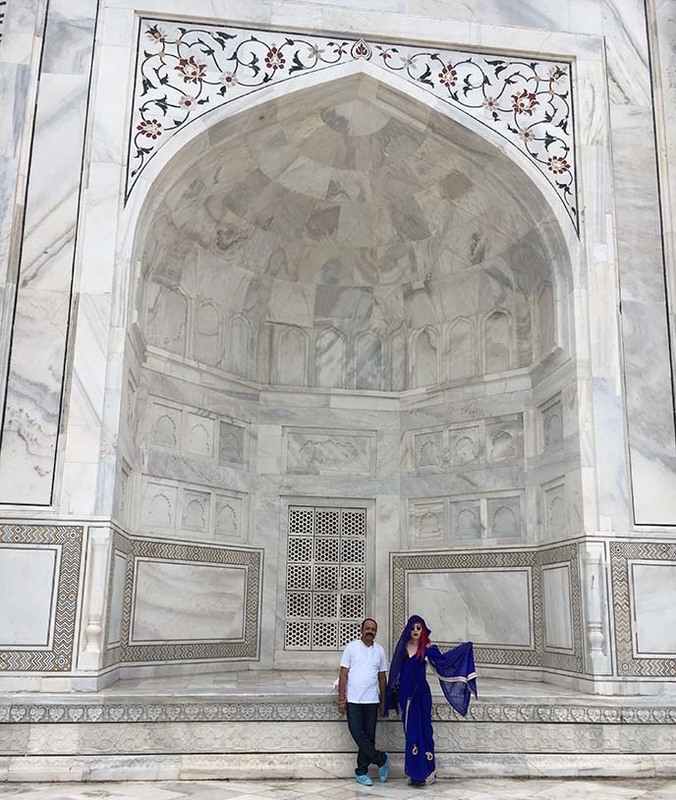 We’re so grateful to Janu Private Tours for showing us the beauty of Agra, and for the unforgettable tour of the Taj Mahal. I hope you enjoyed this very special travel story. You can follow our friend Janu on Facebook and Instagram as well, to learn more about how he can show you the best of India. The sarees are from our lovely hijira friend, what a gift! Neeeeed to go to the TajMahal! It was def worth waking up super early for and visiting! We braved the blood-suckers and werkked it to the max! What an incredible day, so glad we did it together. 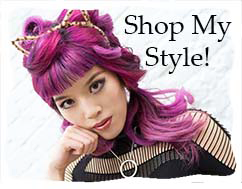 super cool persons of style. Wow…. so colorful and nicely capture pictures. 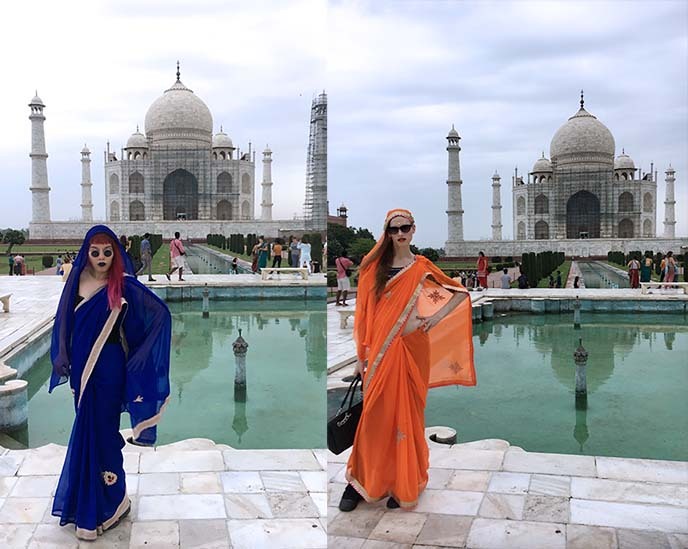 Y’all are killing it in those saris! These photos are all amazing.